"My mother-in-law made this pie in Scotland. It is not a sweet mince pie, but it's easy to make, and a hearty dinner. 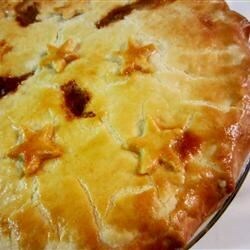 I serve boiled parsley potatoes and a nice salad with this pie. My children always ask for this pie when they come home to visit." Place the ground beef in a large pot and pour in enough water to cover beef. Boil until beef is cooked through. Drain. Add water to cover cooked beef, add onions and enough bouillon granules to taste. Cook until the onions are soft. Season with salt and pepper to your taste and make sure the filling has enough bouillon to have a nice beef flavor. Combine the 1/4 cup water with the cornstarch and stir until smooth. Add to the beef mixture and cook until mixture has thickened. Allow to cool to room temperature. Roll out pastry to fit a 9-inch pie plate. Pour beef mixture into the pastry crust and cover the top with pastry. Crimp edges and prick top. Bake in preheated oven until pie crust is lightly browned, about 40 minutes. We loved this version of a popular meal. I used Bisto (tm) instead of beef boulion cubes or powder. Made a nice thick gravy. Will use this recipe over and over.